Taking nature photos has been educational for me. Even though I grew up here in Tillamook County on the Oregon Coast, it was photography which taught me that bald eagles are not born with white heads, that crows will keep jumping over the heads of birds of prey to annoy them until they fly off leaving their catch, and bubbles from the spittle bug do not come from their mouths but the rear end. Learning about nature by experiencing it, is interesting and rewarding. The beginning journey toward Gallery Of Hope becoming an idea is a medical one. It started back in 2012 after having a "complicated migraine" that somehow damaged my vestibular (balance) system, causing a constant motion sensitivity and visual dependency with my brain. Later that year in a black Friday ad, I saw a cheaply priced Nikon digital camera and immediately bought it as a family gift. 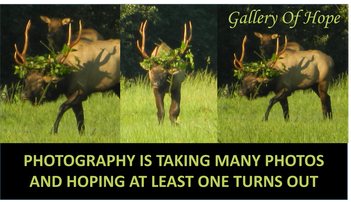 My kids were not interested in it, but nature photography instantly became my passion, coping mechanism, and gift from God. In 2013 after taking many pictures, I wondered what to do with them, and figured out that helping people was my goal. Since taking pictures helps me, I thought of the name Gallery Of Hope and began using my photos in hopes of helping others get through, or accept their challenges, and cope with life situations. When people look at my pictures, I want them to feel better and have hope, joy, laughter, or encouragement. 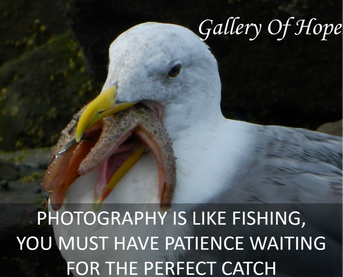 Taking pictures is like fishing, you have to wait for the perfect catch. Many of my pictures are unique from other photographers. I don't let having an inexpensive camera get in the way of unusual shots. I'm amazed at some of the photos my camera has taken and how it can show beauty in animals, birds, and little creatures that usually are taken for granted or not really noticed. I don't have Photoshop, so all these images are real. The Paint Program on my computer is what I use to write text. For years I worked at a local retail store, and many tourists would come in looking for Oregon souvenir and apparel items but get disappointed at the minimum selection. They would say other local stores were too expensive and end up leaving town without good souvenirs. Since there is a need for reasonably priced souvenirs and apparel items for tourists, Oregon and Oregon Coast designs are included with Gallery Of Hope to help tourists and fellow Oregonians enjoy the beauty of Oregon. Life can be hard with many challenges - Stay strong, find your peace & strength, and enjoy nature as much as possible.